I needed the perfect delivery vessel for an upcoming AWE-MAZING Hot Dip Recipe. I can’t tell you what that recipe is quite yet (it’s a gift that hasn’t been delivered), but I can tell you about these perfectly Crispy Baked Potato Wedges. We start with medium sized russet baking potatoes, each cut into 8 long wedges. The key to getting a soft inside and crispy outside on these pub fries is to parboil them for 5 minutes before they hit the oven. Once boiled the wedges should be drained immediately then returned to the hot pot to dry out. You can then season your Potato Wedges according to your taste buds or to compliment dishes they’ll be served with. On this occasion I tossed them in olive oil and Cajun seasoning. Parmesan Herb is another favorite combo, as is Rosemary Black Pepper, Buttermilk Ranch, and Steak House seasoning. Very versatile and always delicious. For anyone who questions whether you can achieve crispy perfection without deep frying, I hope the above picture puts your mind at ease. Baked in a hot 450 degree oven, turned over once, baked until golden brown. This batch of spud-love screamed Fry Sauce. 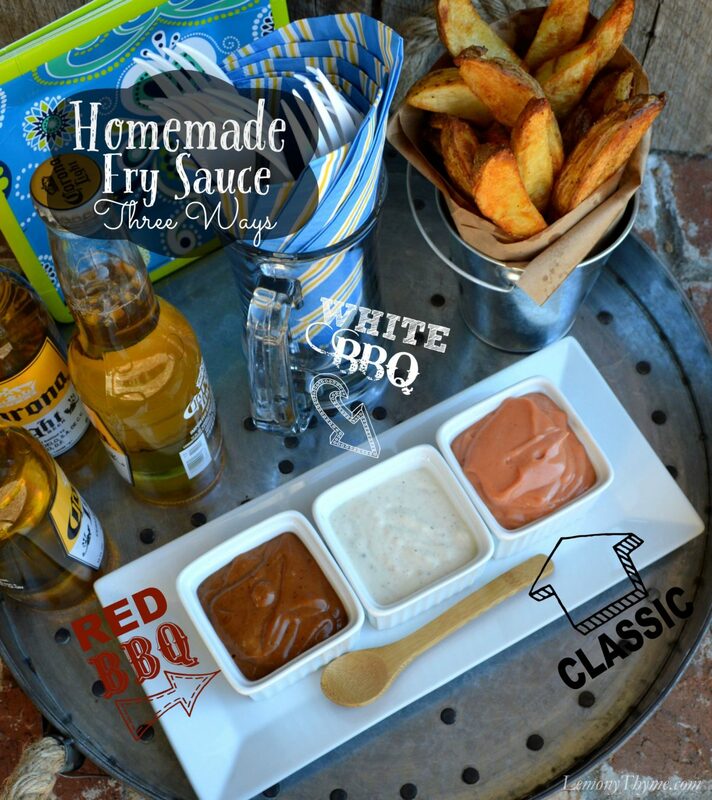 Not one Classic Fry Sauce, but three varieties of Homemade Fry Sauce. We were just a dippin’ and a dunkin’ in our Game Day Glory yesterday. So whether you make Crispy Baked Potato Wedges to serve along side a Cowboy Cut Ribeye or raked through your New Favorite Hot Dip Recipe, you’ll agree this easy recipe turns out perfection every time. Wash potatoes and cut each into 8 long wedges. Place wedges in a large pot covered with salted water. Bring to a boil and boil for 5 minutes. Drain. Return to pot to dry. Cool slightly. Preheat oven to 450 degrees. Coat baking sheet with cooking spray. Toss wedges with olive oil and seasoning. Spread onto a baking sheet in a single layer. Bake for 15, turn over and bake an additional 10 minutes or until crispy golden brown. Serve with Fry Sauce or favorite dip. Haha. I’d eat them any time of day too.